Do you suppose this reclusive snowman is looking to sell, or to purchase snowman seeds? Or is he figuring in his head how many nickles it would take to grow a basketball team of Snow Friends? Or is it as my 4 year old grandson declared, "Hey! That snowman is smushed down into a bucket!" No matter what his motive, I'd welcome his sweet face peeking over my fence anytime. I'd even give him a fist full of nickles if it meant he'd haul some snow off my driveway. 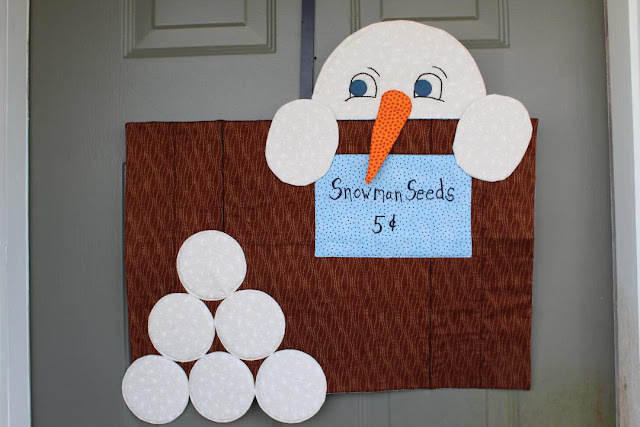 Here's some Winter trivia: This cute snowman will hang on my door for the month of January. Nevertheless, it is not January, but March that is the snowiest month where I live in Utah. How much snow you get and when? Tell us in the comments below. Double sided fusible like Heat n Bond lite. Press and starch all fabrics. I like Mary Ellen's Best Press. The fence is the the base for all the rest so let's start there. 1 Brown rectangle 16 ½” T x 26 ½”W . Pay attention to your print if it's directional. On the back of the Brown Rectangle, mark lines at 3 ½ “ and 7” from each end. Fold Right Sides Together (RST) at the lines and press well. I recommend a good spritz of starch along the lines before pressing for a nice crisp fold. Sew a pleat along the crease RST at the 3 ½” marks on both ends sewing a ¼” seam. 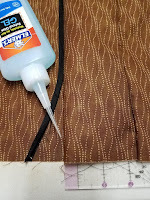 Spritz the black strips with starch and fold in half lengthwise pressing well to creating a ¼” flange. Using WASHABLE School glue, inset the flanges into the folds of the brown fabric at the 7” marks. I found this to be a lot easier using the ruler underneath as a guide. Fold the brown fabric RST with the flanges inset and sew along the fold using a ¼” seam allowance. Press the seams toward the outside. The brown rectangle should now measure 16 ½” x 24 ½”. Match up the brown rectangle with the backing rectangle RST. Sew all the way around using a ¼” seam allowance. Leave a 6” hole for turning at the bottom left close to the corner of the rectangle. Backstitch at the beginning and end. Clip the corners to reduce bulk and turn the piece right side out. Gently push out the corners as square as possible. Scrunch the Bosal accordion style and stuff it into the rectangle through the hole. Push, pull, and pinch until the Bosal lays flat inside. If it's too big, pull it out and trim as needed. When it's all nice and settled, run a hot iron over it to activate the fusible. Zig zag the hole opening to finish the raw edges. This will be covered so it doesn't have to be beautiful. Using black thread and a Stitch in the Ditch seam guide for perfectly straight seams, topstitch down the pleats between the “fence slats” for definition. Feel free to do more quilting if you like. Did you watch the recommended video of Lori Holt's applique? If my instructions don't make sense, the video will help. Skip to time stamp about 4:00. 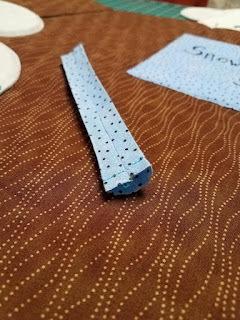 Fold the ½ yard of snow fabric in half lengthwise RST. 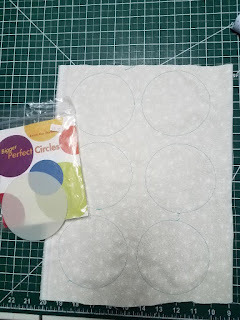 Draw 6 – 4” circles at one end leaving 1” between for seam allowance. Cut this part away from the rest of the fabric for manageability. Sew all around the 6 circles. If you sew just outside the drawn lines the Bosal will fit inside better. 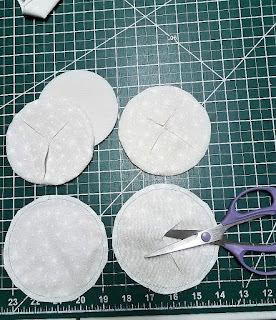 Cut out the fabric circles leaving a scant ¼” seam. Pinch the front and back fabrics and pull away from each other. Cut a small hole in the back then enlarge it with 3 – 4 snips. Be careful not to snip the front of the snowball. Use a corner turner, stylus or other object to gently smooth out the circle edges. Stuff one of the Bosal circles inside and push, pull and pinch until it lays flat inside. When it's all flat and round, push the cuts back together and run a hot iron over both sides to activate the fusible. You'll be doing this with all the pieces. I won't write it out every time. You're welcome. Stack the 6 finished snowballs, face down, into a pyramid. 3 snowballs at the base, then 2, then 1. With a fabric marker (pink in the photo) make a mark where any 2 snowballs touch. Then hand sew them together with a few stitches at these marks. Some will touch in 2 places, some in 3 and one in 4 places. Try to keep these stitches invisible. When the pyramid is tacked together, set it aside with the fence. Determine the desired width and height of the finished oval. Draw a rectangle that size. Use a circle template with a diameter that matches the desired width. Inside the rectangle, place the circle template touching the line at the top. Trace the template from where it touches one side of the rectangle to the other side. Slide the template so it touches the line at the bottom. Trace again from side point to side point. 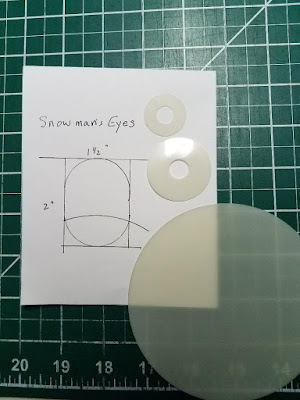 For us visual learners, there is a diagram below for the snowman's eyes which are drawn using the same method. 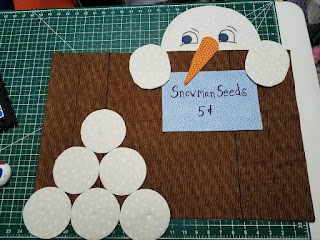 The finished snowman's hands are 4”x 5” ovals. Using the same method as the Snowballs, make 2 snowman hands. Set aside with the other parts. The nose is made with the same sew, snip and stuff method. You'll need to hand draw the nose. Nothing hard or fancy. Draw a triangle with a 2” base that's 5 ½” tall. Round the base (which will be the top of the nose) like a snow cone using the circle template. Now you have a 6” long carrot template. When you cut the bosal insert, it won't need to go all the way to the point of the carrot. There will be enough bulk from the seam allowance to fill the tip. Feel the tip for fullness and chop off the tip of the bosal to accommodate, leaving the width. It will probably take a few tries and trims to get the bosal to lay flat inside the carrot. Your carrot need not have straight edges. Lumps add character. Fuse and set aside the carrot with the other pieces. The Snowman's head shape is drawn in the same way as the hands. The only difference is that the face only requires half an oval 10” wide x 8”tall (finished). I traced around a 10 inch plate then straightened the sides beginning at the widest point. Now we draw eyes … this has never been part of my skill set. When in doubt, ask Pinterest. I had an idea about what I wanted the eyes to look like. My Pinterest search taught me that I was trying to make the eyes much too large. Apparently snowmen have small-ish eyes. For the template, I drew an oval 1 ½” wide x 2” tall then cut the bottom of the oval off in a concave arc drawn with a 4 1/2" circle template. I used the template and a mechanical pencil (not Frixion pens) to draw the eyes on the fabric. Then added a half inch extension on the bottom line to indicate smiling cheeks. Don't forget to flip the template over when tracing the second eye. I left space between the eyes to accommodate his carrot nose without crowding. We'll add that later. 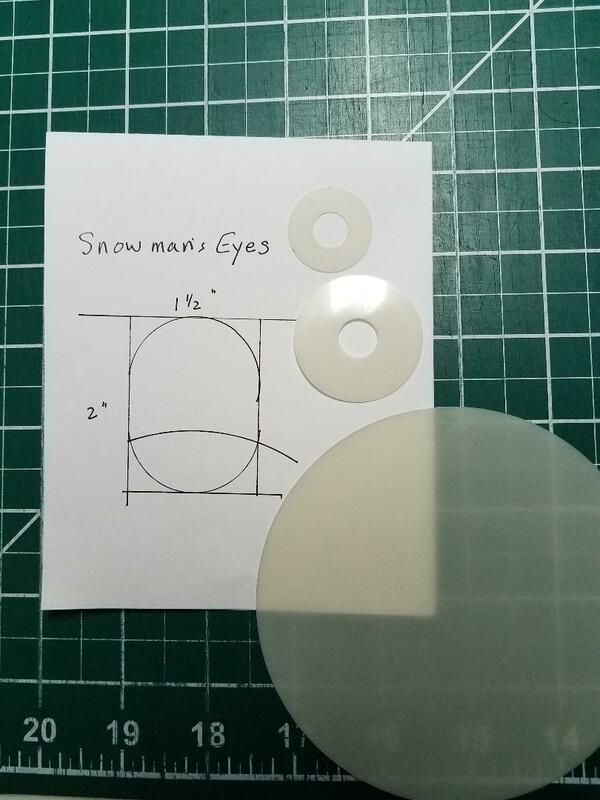 The snowman's expression will be determined by the placement of the nose, eyes and eyebrows. Try a few options before you commit. I've been known to use the pen to sketch directly onto fabric. If it doesn't look right I just hit it with a hot iron to erase what I don't like and start again. Don't do that with this project! The ink in the Frixion pen doesn't actually “disappear” when heat is applied. It fades so we can't see it, but it's still there. The ink reacts to heat and it can also reappear if it gets cold. I plan to hang this project on my front door. It gets very cold here in January. If I have Frixion pen lines all over my fabric, I run the risk of having them reappear in the cold. Using size 5 pearl cotton, embroider the eyes following the lines you drew. Use a simple stem stitch. Don't forget to add eyebrows. Reunite the face with the backing RST. Sew around with a 1/4" seam allowance, leaving the bottom open. Cut the Bosal insert into a half oval 10” wide x 7” tall. Snug it inside the head, try to get the seam allowance behind the bosal. when it's laying flat, hit it with the hot iron on both sides. Use a 1" perfect circle template to make the blue eye centers. Glue the eye centers in place so they don't slip while sewing. Use a small blanket stitch and a guide foot to sew the eyes in place. Fold about a half inch of the bottom of the head peice, raw edge toward the front, sew to finish. This will be hidden so it doesn't have to be beautiful. While we're at it, let's add the nose to the face. Place the head behind the fence while you decide where you want the nose for maximum expression. Pin and stitch down the top curve of the nose onto the face. Just the arch and a half inch or so on each side is all that needs stitching. Use a Stitch in the Ditch guide foot and a straight stitch. Back stitch at the start and stop. The rest of the nose will poke out from the face like a proper 3D carrot nose should. Set the head aside with the other pieces. Decide what you want the sign to say and how you'll transfer it to the fabric. There are a million ways to do the lettering on your sign. I went lo-tech and hand wrote it with a Sharpie marker. Layer the sign front RST with its back. Sew all the way around, trim the corners to reduce bulk. Then snip the back and turn in the same way we've been doing. You can put Bosal inside for dimension if you like. I didn't. Starch and press the sign so it's nice and flat. CONGRATULATIONS! All your pieces are made and ready for assembly. Tip: Arrange all your parts so you know what you are working toward. Take a photo for reference, and write some notes. For example: Sign: 2” from top, 3 1/2” from right side. Head rise: 6”. Pin, glue or fuse the sign into place. Then sew all the way around very close to the edges. You can use an applique stitch or a straight stitch. I used a straight stitch with a stitch-in-the-ditch guide foot. Next, the Snowballs. Again I'm using a straight stitch and a guide foot. A swirl design in these might be cute if you have free motion quilting skill. You could do the design before you sew them on, or as a means of sewing them on. When you place the snowball pyramid, align the tacking stitches of the bottom layer of snowballs with the bottom of the fence to hide the zig-zaged hole we used for turning. The pyramid will overhang about 1 3/4” on the bottom and 1/2” on the left side. Pin the pyramid in place. Curved pins work best with the Bosal. Sew around each snowball, including the parts that overhang. If your machine doesn't like sewing through multiple layers of foam you can hand stitch with a simple applique stitch. You'll just need to catch the bottom fabric from the snowballs and the top fabric from the fence. Tip: For a more decorative, hand quilted look you can do stab stitching with a contrasting pearl cotton. 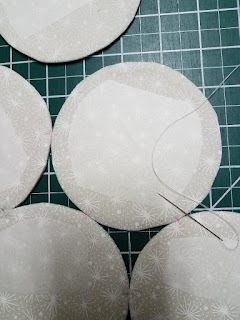 Stab stitching is just what it sounds like: Stab the needle straight down through all the layers, then straight up through all the layers about ¼” away, sort of like cross-stitching only in a running stitch. If you choose this method you'll want to do the same stitched look around the outside edges of the hands and face for continuity. Pin the nose out of the way while we attach the head to the fence. Pin the face into place behind the fence and roughly centered over the sign. I gave mine a ¼” tilt for fun so it looks like he's keeping an eye on the snowballs. Draw a line on the back of the fence about ¼” above where the bottom of the face comes to. If you tilted the head, also tilt the line. The finished door hanging will not be equally balanced. We'll make a partial hanging sleeve where we can thread a rod which will hang on Command hooks. At the end of the season, we'll just pop the hooks off the door. They don't leave any marks if you follow the manufacturer directions. For a 1/2" diameter hanging rod or dowel, use a rectangle piece of your backing fabric not smaller than 3" x 6 ½”. Fold over the short ends and sew to finish the edges. Sew the long sides RST with a ¼” seam allowance. Finger press the seam open. Turn the sleeve right side out and arrange so the seam lays flat on the pressing surface. Finger press a fold about ½” above the seam down the length of the tube. Mist the fold with starch and press. Avoid pressing the other side of the tube. Again lay the seam and pressed edge flat. 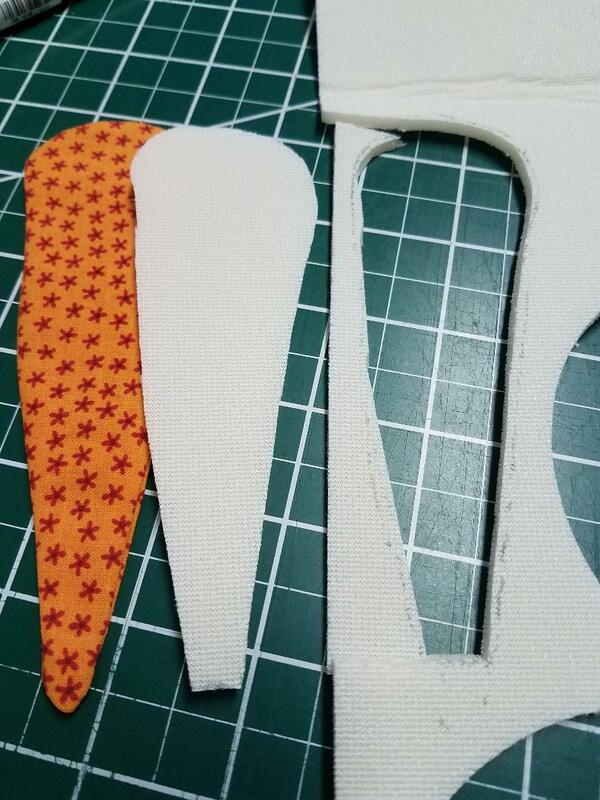 Slide the top fabric up from the seam so the tube creates a D shape about ¾” tall. Finger press the fold created along the edge. Mist the fold with starch and press. Pin or Glue (recommended) one fold of the D shaped sleeve along the very top of the fence starting about the same distance from the Left side as the snowman face sits from the Right side. Pin the other fold so it won't get caught in the stitching. With thread that matches the fence fabric, topstitch all across the top of the fence to attach the head. Make sure you catch the top edge of the hanging sleeve. Hand stitch the bottom fold of the little hanging sleeve. Hand stitch the bottom edge of the head to the back of the fence along the line you drew. Don't let your stitches go through to the front. There should be enough height in the sleeve and under the face hem for your dowel to pass through. The finish is at Hand... get it? All we have left is putting the hands on! The issue to address with the hands is sewing them on with out sewing the hanging sleeve closed. Place them where you want them, then mark where you'll need to start and stop to protect the hanging sleeve. Topstitch that part before pinning the hands in place on the fence. If I were doing it that way I'd also avoid topstitching the hands onto the face. Yep, I've hot glued the hands to the fence. I'd be willing to bet I haven't used hot glue in 20 years. But it seemed like the best choice for this. Of course, I have some concern about the glue holding when it's mid-winter, so I put three tacking stitches in each hand. One at each side where it meets the fence and one where it's touching the sign. YIPPEE!!! We officially have Snowman Seeds for sale at our house! I love it. I hope you do to! I'm off to enjoy a cup of hot chocolate and some time with my own warm-blooded Snowman. Share photos of your snowman on Facebook. I wish you a happy, safe and prosperous New Year. PS. Please don't drink and drive. RB, this pattern is the cutest. I am pinning it for later. I need to finish a commitment quilt first. Thanks for sharing. Thanks Veronica. I hope you enjoy makeing it. It's different because of the foam, but it's not difficult. If you have any questions, I'm happy to clarify anything.